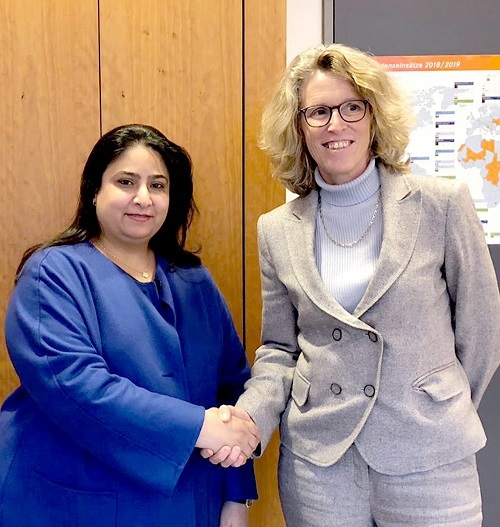 The Undersecretary of the Ministry of Foreign Affairs and Chairman of the National Committee on the Prohibition of Chemical Weapons Development, Production, Use and Stockpiling and their Destruction, Dr. Shaikha Rana bint Isa bin Daij Al Khalifa, met with the Federal Government Commissioner for Disarmament and Arms Control, Susanne Baumann. During the meeting, the Undersecretary of the Ministry of Foreign Affairs highlighted the efforts and achievement of the Kingdom of Bahrain to strengthen the national legislative system to keep abreast of developments in the field of non-proliferation of weapons of mass destruction, nothing the important role of the Organization for the Prohibition of Chemical Weapons in this regard. The two sides stressed the importance of strengthening bilateral cooperation in order to maintain international peace and security. For her part, the Federal Government Commissioner for Disarmament and Arms Control praised the Kingdom of Bahrain's commitment to ban the use and proliferation of chemical weapons, noting that the full implementation of the Convention on the Prohibition of Chemical Weapons and the Biological Weapons Convention is necessary to limit the proliferation of weapons of mass destruction. 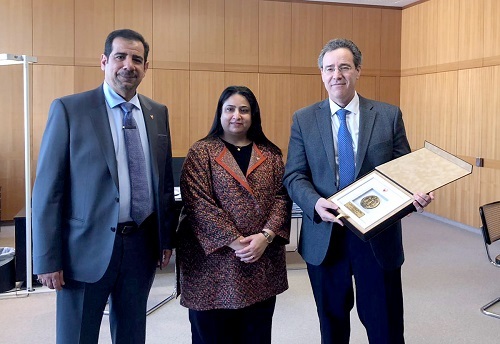 Dr. Shaikha Rana also met with the Regional Director for the Middle East and North Africa at the German Foreign Office, Ambassador Christian Buck, during which they exchanged views on the most important regional issues related to regional security. She stressed the role of the Kingdom of Bahrain in the application of the principles of international law to ensure the reduction of the proliferation of weapons of mass destruction in the region. In this regard, Ambassador Buck praised national mechanisms and legislation developed by the Kingdom in cooperation with the relevant authorities. The Undersecretary of the Ministry of Foreign Affairs also met with the Director-General for Economic Affairs and Sustainable Development at the German Foreign Office, Ambassador Miguel Berger. The meeting discussed joint cooperation in the economic, investment and renewable energy fields. For his part, Ambassador Miguel Berger praised the progress made by the Kingdom of Bahrain in the development of plans and programs that will achieve economic diversification and sustainable and comprehensive development, stressing in this regard his country's keenness to strengthen relations with the Kingdom of Bahrain to support the interests of both countries. 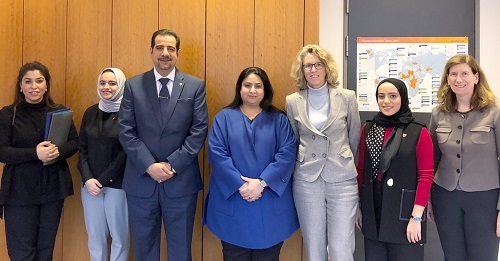 The Ambassador of the Kingdom of Bahrain to the Federal Republic of Germany, Abdullah Abdullatif Abdullah, praised the friendly relations and cooperation between the Kingdom of Bahrain and the Federal Republic of Germany, expressing his aspirations of further cooperation and joint coordination on regional and international issues.